Construction of the second deep-water berth in DCT Gdansk (T2) became a fact. 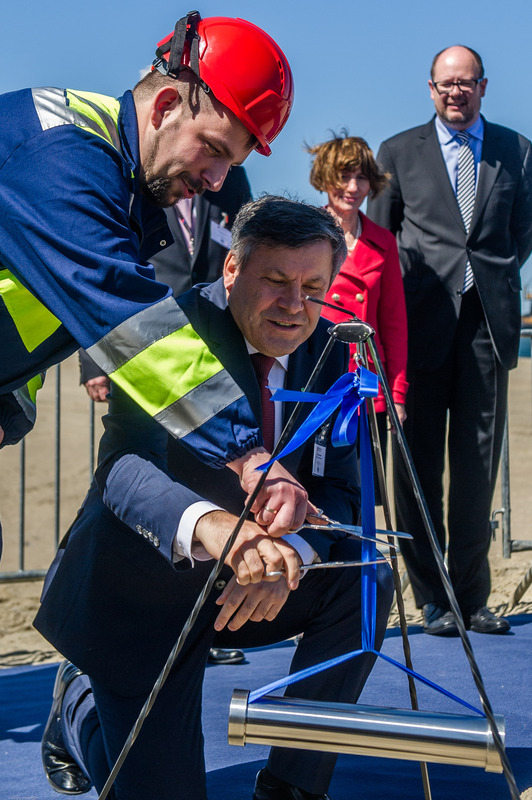 Janusz Piechocinski, Deputy Prime Minister of Poland, officially inaugurated the construction of the new terminal. Completion of this project with an investment amounting to EUR 200 million, which is financed by the consortium of 7 banks, is scheduled for the third quarter of 2016. “Gdansk regained its position as a city playing significant role in international sea transport. DCT, with two deep-water terminals, capable of handling 3 million TEU annually, is a trigger for the external trade development not only in Poland but also in the whole region of Central Eastern Europe. This reflects the growing potential of Polish importers and exporters, who are more competitive now, when they benefit from direct vessel calls from the Far East to the Baltic” said Janusz Piechocinski. Building the second berth in DCT Gdansk is also an important factor in Polish infrastructure development. “Gdansk could have never become such an important commercial center if it did not have fine infrastructure linking it with Polish hinterland and countries neighboring Poland. Polish road and rail infrastructure has improved dramatically during last 10 years and thanks to investments such as the second deep-water berth in Gdansk, we continue improving the quality of Polish transport corridors” added Maciek Kwiatkowski, CEO of DCT Gdansk. The T2 groundbreaking ceremony took place on Friday, 15th of May, 2015. The inauguration of the construction works was preceded by the round table discussion, which was a good opportunity to raise awareness of Australia’s contribution to Poland’s and the broader region’s growth. The main theme was innovation as the key to accelerating economic growth in Poland. Discussion participants tried to answer the question if Australian investments in logistics and energy can assist in transformation of Poland and Central Eastern Europe. The round table discussion was organized together with Embassy of the Commonwealth of Australia and Austrade – Australian Trade Commission. “DCT Gdansk, as Polish investment of Australian shareholders combines the experience of both countries and contributes this special mix of know-how and innovation to Poland’s economy. We are proud to be a beneficiary of successful impact of Australia’s best practices in managing business” concluded Maciek Kwiatkowski. During the inauguration a time capsule containing message regarding the meaning of DCT’s investment and its current influence on region’s economy, was placed at T2 construction site. Its exact location will be marked with a special memorial plaque.